Facts and history about the life and lifestyles of Native American Indians. The Native American Dream Catcher, or Dreamcatcher, was devised by the Woodland group of Native Indians as a protective charm or device, originally for the children of the tribes. The Dream catcher was believed to protect a person from the bad spirits that appeared in bad dreams and nightmares. The dream catcher was constructed in a spider web design using a wooden hoop that was attached to a woven web or loose net, so it looked like a spider's web. The dream catcher was then decorated with sacred and personal objects such as feathers and beads. The life, history and lifestyle of Native American Indians is a varied and fascinating subject. The following fact sheet contains interesting facts and information on Dream Catcher. Dream Catcher Fact 2: Origin: The Dream catcher originated with the Chppewa (Objiwe) Tribe and was based on the legends, myths and creation story of the people. Dream Catcher Fact 3: Origin: The Chippewa (Ojibwe) people base the dreamcatcher on an ancient myth surrounding 'Asibikaashi', the Spider Woman who took care of the children and the people of the tribe. Dream Catcher Fact 5: The dream catcher was hung by a sleeping child as a protective charm to prevent nightmares, night terrors and other bad dreams. 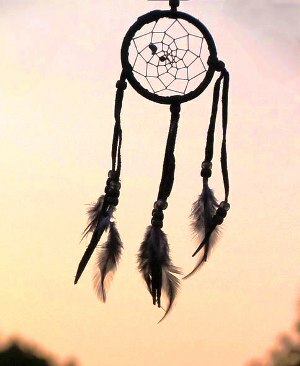 Dream Catcher Fact 8: The purpose of the dreamcatcher was described by the Sioux tribe as follows: "Nightmares pass through the holes and out of the window. The good dreams are trapped in the web, and then slide down the feathers to the sleeping person." Dream Catcher Fact 10: It was traditional to attach a feather to the center of a baby's dreamcatcher and hang it on, or above, a bed or cradle board. They were hung in the tepee or outside on the branch of a tree. Dream Catcher Fact 11: The feather of an owl, representing wisdom, was hung from a girl's dreamcatcher. The feather of an eagle, representing strength and courage, was hung from a boy's dreamcatcher. Dream Catcher Fact 12: The Dreamcatcher was made from a wooden hoop, usually of willow, about 3½ inches in diameter. Sinew was attached to the hoop in spider web design.